Public diplomacy and nation branding activities often require close cooperation between numerous stakeholders. MFAs are in a unique position to coordinate public diplomacy and nation branding efforts as they may work horizontally with other governmental branches, PR firms and corporations and vertically with their network of embassies located all over the world. In the age of SNS, MFAs and their embassies may constitute social networks especially if the MFA and its embassies follow one another on social media. 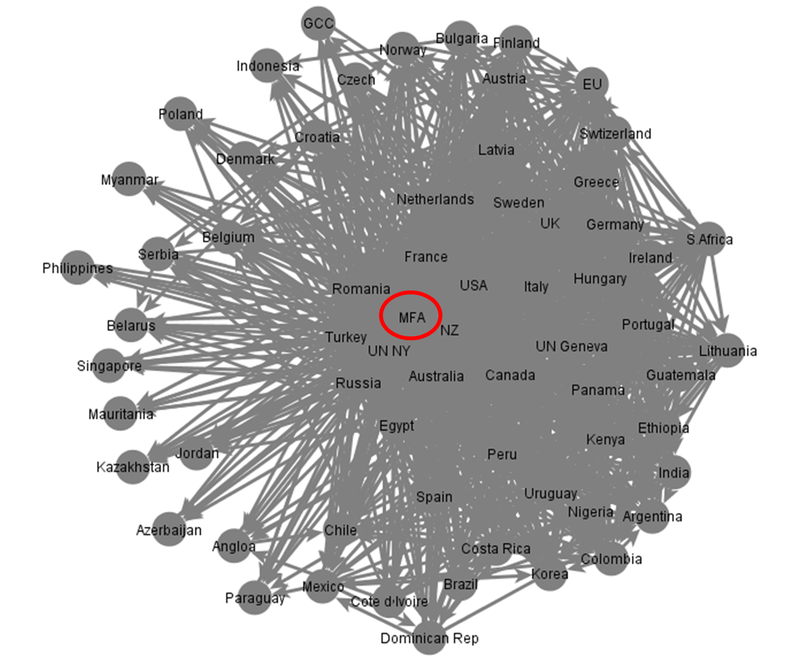 In fact, some MFAs use social networks in order to effectively disseminate foreign policy messages. In the Israeli digital diplomacy model, the MFA’s Facebook profile and twitter pages serve as information centers for social media managers at the embassy level. An embassy social media manger can visit the MFAs channels and learn what’s “the message of the day”. The closer an MFAs internal social network, the greater its ability to disseminate information on a global scale. While SNS content at the embassy level should be tailored to the unique characteristics of the local population, some content is relevant to all embassies (e.g., global initiatives such as the UK’s end to sexual violence in conflicts, information regarding escalating tensions in Ukraine). In order to use social media as an information network and MFA must be at the heart of its social network. How central are MFAs in such networks? In addition to the MFA, the UN serves as a global diplomacy hub. 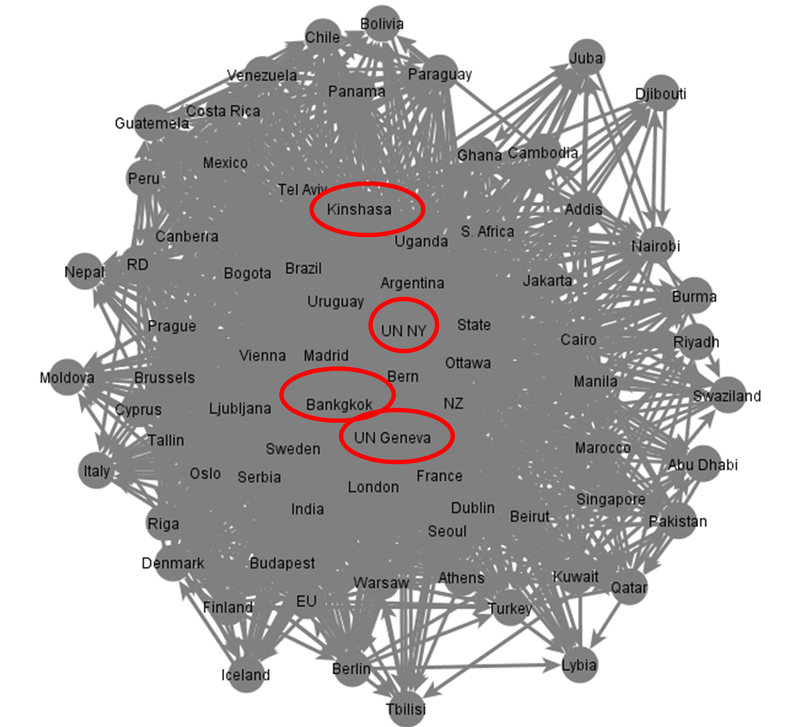 How central are UN embassies in an MFA’s social network? My analysis of the three MFAs appears below. 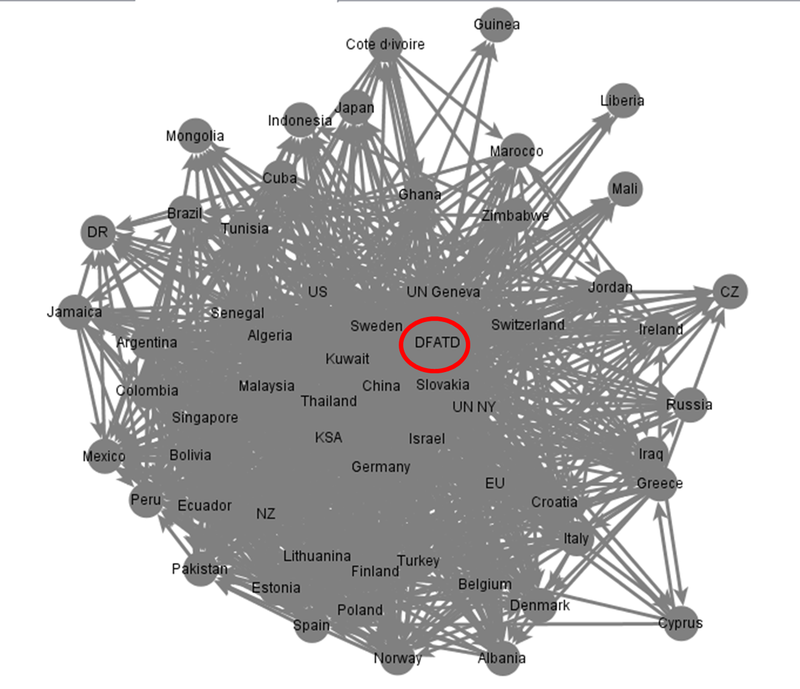 In order to analyze the DFATD’s social network I compiled a sample of 59 embassies spanning the globe. The DFATD’s social network appears in the image below. The results of this analysis are shown in the table below. My analysis revealed that the Canada’s DFTAD leads in all three parameters as it is followed by 57 of 59 embassies in the sample. This indicates that it is the most popular member of the network and its greatest “connector”. The MFA is therefor able to effectively gather and disseminate information to all embassies. Secondly, it is interesting to find that Canada’s embassies to the UN in New York and UN in Geneva score high in both popularity and Betweness. This could attest to the UN’s importance as a global diplomatic hub. Third, Israel and Sweden are the only two Canadian embassies to score high on all the parameters. Finally, in Canada’s case the in-degree parameter is not related to the geo-political importance of nations. For instance, the embassies in Algeria, Ecuador and Peru are more popular than embassies to Russia, India and the US. Thus, it is possible that through digital diplomacy, embassies can increase their centrality in internal MFA activity. In order to analyze the MFA’s social network I compiled a sample of 65 embassies spanning the globe. The MFA’s social network appears in the image below. The table below presents the in-degree, out-degree and Betweness analysis of embassies comprising the Israeli MFA’s social network. My analysis revealed that as was the case with Canada’s DFATD, Israel’s MFA scores the highest on all three parameters evaluated and is at the heart of its social network. Secondly, the Israeli embassy to the UN in New York also scores extremely high on all three parameters. However, unlike Canada’s DFATD, there seems to be some correlation between an Israeli embassy’s popularity and the geo-political importance of its location. The embassies in the US and the UK and are the most popular in this social network followed by Canada, which is one of Israel’s most prominent allies, and Australia which is also a supporter of Israel. Germany and Turkey are also important to Israeli diplomacy and they score high in the in-degree parameter. The centrality of these embassies is shown in the image below. In order to analyze the State Dept’s social network I compiled a sample of 75 embassies spanning the globe. State’s social network appears in the image below. The table below presents the in-degree, out-degree and Betweness analysis of embassies comprising State’s social network. As was the case with Canada and Israel, the State Department scores highest on all three parameters. The US embassies to the UN in NY and Geneva are prominent in this network. 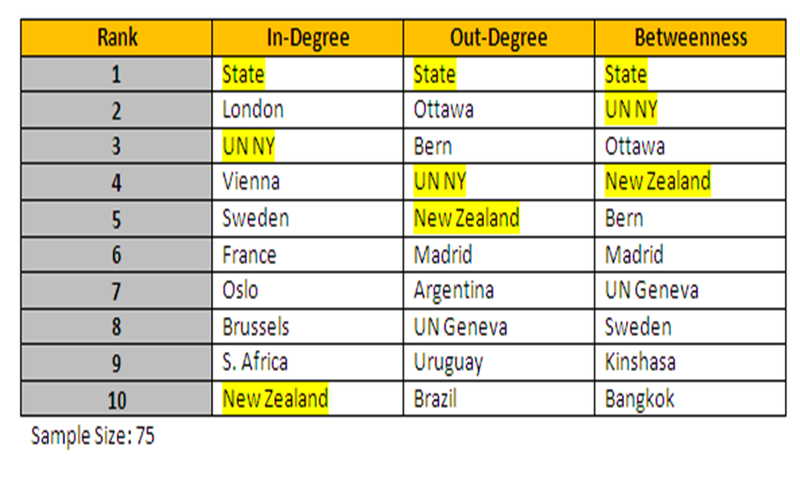 In fact, the UN in NY embassy is one of only two embassies to score high on all three parameters (along with New Zealand). In the State’s case, embassy popularity does not seem to be tied to geo-politics as was the case with Canada. For instance, the embassies in New Zealand and S. Africa are more popular than those in Russia, India and Japan. In the Betweness score, the embassies in Kinshasa and Bangkok score much higher the embassies to G-7 countries. The image below demonstrates the centrality of smaller embassies to the State’s social network. Which MFA is the most connected? 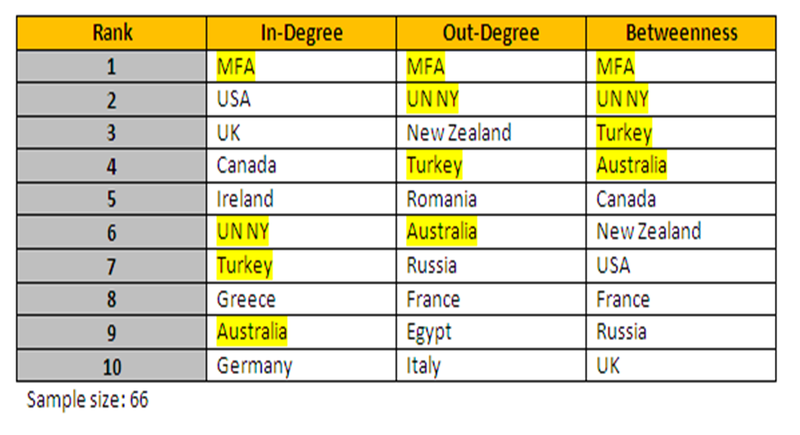 After analyzing all three MFAs I attempted to analyze which MFA is the most connected to it’s embassies. 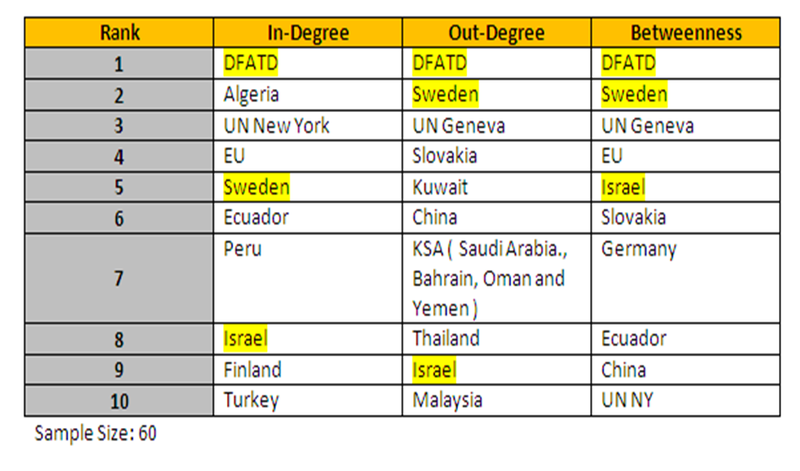 Using the in-degree and out-degree parameters I found that Israel’s MFA is the most connected MFA to its embassies followed by Canada and the US which comes in a third place. However, the differences in MFA scores are small indicating that all three MFAs are the center so their respective social networks. Moreover, Using samples of 59 embassies I found that the average Israeli embassy is followed by 8 of its peers while a Canadian embassy attracts an average of 20 Canadian embassies and an American embassy attracts an average of 25 of its peers. In summary, it seems that MFAs do constitute information networks in which the MFA is the most prominent member. Likewise, UN embassies are important members of these global information networks. Finally, as is the case with nations, digital diplomacy may be used by embassies in order to level the diplomatic playing field and position themselves at the heart of their MFA’s activity. Posted in Uncategorized and tagged Canada, Digital Diplomacy, Israel, Network Analysis, social networks, Twitter, US. Bookmark the permalink.